Large red steel bicycle with an aluminum basket on the front and a rack attached to the rear. 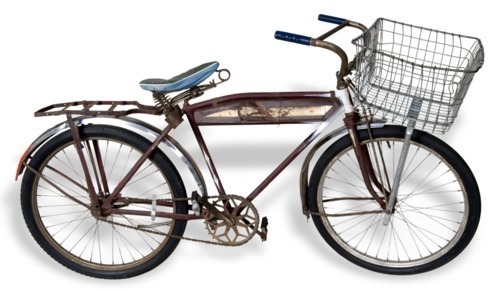 This is a Montgomery Ward Hawthorne bicycle purchased by Hiram Dickson in 1934 for $34. Dickson raised the money from the sale of pigs he had raised for 4-H projects. He used the bicycle to ride to the Admire High School in Kansas. Dickson later married and moved his family to Topeka where his two sons used the bicycle to deliver the Topeka Journal in 1954. Welding on the pedals was done at the Admire Blacksmith Shop.